Hello from Accent Realtors! We hope your year is off to a great start. Spring is here and now is the perfect time to start your big spring clean. 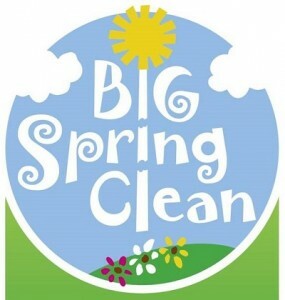 To help you get a head start, we’ve compiled a list of some of the most important spring cleaning details. Painting interior walls or even your home’s exterior can make all the difference. Whether you choose a whole new color or just choose to add a new coat to your current one, your house will look and feel like new. In addition to painting, sprucing up your home’s interior design can give it a fresh feel for spring, too. There are a ton of inexpensive, DIY ideas on Pinterest to get your interior decorating creativity flowing. Give your painted walls a light clean by wiping them down with a damp cloth. For dirtier walls, try dampening the cloth with both water and dish soap. Deep clean your carpet, steam those hardwood floors, and scrub that tile; it makes all the difference. We recommend Carpet Direct or Preferred Carpet Care, Inc for all your flooring and carpet needs. Whether it’s clearing the weeds out of the flower beds, mowing the lawn, or cleaning the lawn furniture, your outdoor space is just as important as the indoor space! With summer right around the corner, fixing up your yard now will make outdoor entertaining easier and less stressful later. There are many elements of the kitchen that are often neglected. Your stove, counters, sink, and refrigerator may not be getting the love they need during your daily or weekly quick cleans. At least once a year, it’s a good idea to give these areas a thorough deep clean. When cleaning your stove, start by soaking the drip pans, stove burners, and dirty knobs in warm, soapy water. By the time you finish cleaning the stove counter, it will be easier to clean them. Disinfect your disposal by tossing in a combo of cut up lemon, a small handful of salt, and a couple ice cubes. Or try baking soda and vinegar for an extra strong scent-buster and disinfectant. When it comes to the fridge, it’s best to start by taking everything out. Separate what you have into categories such as veggies, lunch meat, etc. Wipe down any messy bottles or jars, throw away what you don’t use, and toss out anything that has expired. Then take out any drawers or shelves and soak them in soapy water. Finally, wipe out the entire fridge with a towel dipped in warm, soapy water. It’s also helpful to keep foods categorized as you place them back into the fridge. Make your own scum-busting shower cleaner by using ¾ cup vinegar mixed with ¾ cup of Dawn dish detergent. It works great and can save you lots of money on expensive cleaners. Making your own toilet cleaner is easy and inexpensive too. Simply add 1 cup of vinegar and ¼ cup of baking soda to the bowl, let it sit for 15 minutes or more, scrub the bowl, flush, and you’re done! Get rid of any clothing in your closet that you bought last year and have never worn. Donate it or give it as a hand me down, just don’t let it continue to clutter your space. After you’ve removed all your unworn and unwanted clothes, place them back in the closet with the hanger facing the wrong way. After wearing that item place the hanger the right way. At the end of the year, get rid of all the items whose hangers never turned. 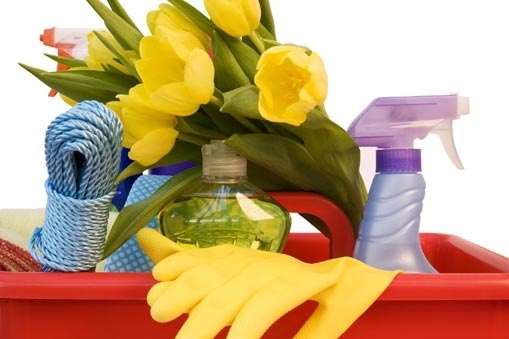 What are your go-to strategies for keeping everything clean and in order in your home? Tell us in the comments below!